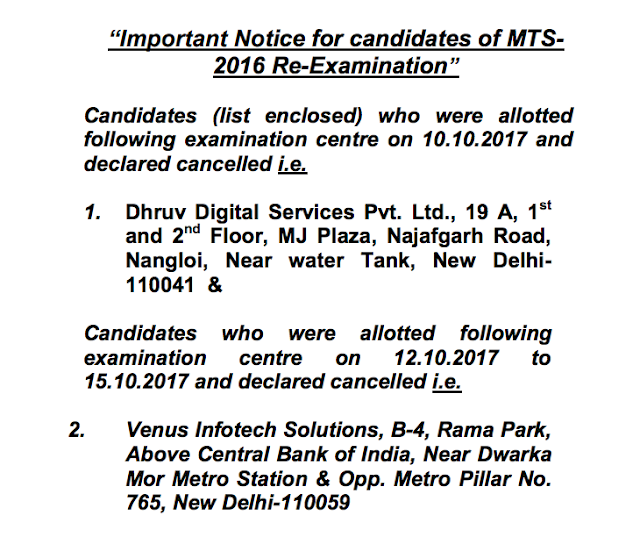 Candidates (list enclosed) who were allotted following examination centre on 10.10.2017 and declared cancelled i.e. 1. Dhruv Digital Services Pvt. Ltd., 19 A, 1st and 2nd Floor, MJ Plaza, Najafgarh Road, Nangloi, Near water Tank, New Delhi- 110041 & Candidates who were allotted following examination centre on 12.10.2017 to 15.10.2017 and declared cancelled i.e. 2. Venus Infotech Solutions, B-4, Rama Park, Above Central Bank of India, Near Dwarka Mor Metro Station & Opp. Metro Pillar No. 765, New Delhi-110059 are kindly requested to download their Revised admission certificate from the SSC NR website i.e. sscnr.net.in for their Re-examination scheduled on 24.10.2017.